One of the most complex studios in the Kaleidica collection of studios is the Star Studio. 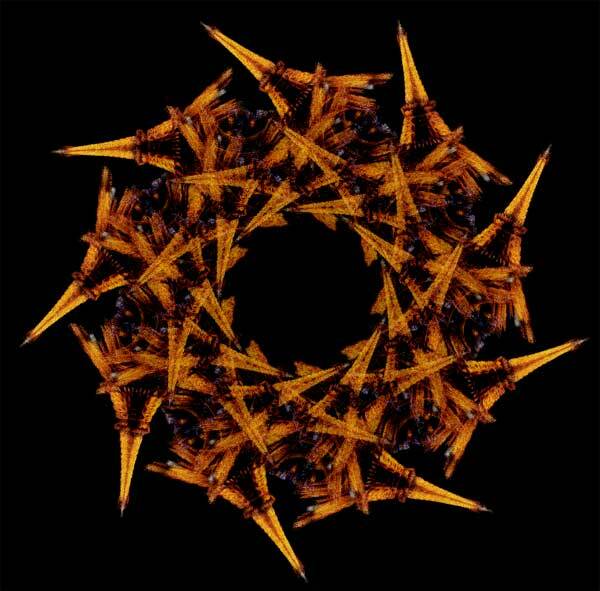 Here you can draw stars with any number of points and in fantastically dis-similar ways to create precision stars or abstract patterns that resemble more fractal imagey or "sponge painting." But before you jump into using the Start Studio there are a few starter tips and hints that will make your explorations more satisfying and fruitful. For starters... take a look at the Start Studio user interface below. Here you can adjust several aspects of your star including "points," "stellar," "draws," and more familar variables like "size," and "blend." 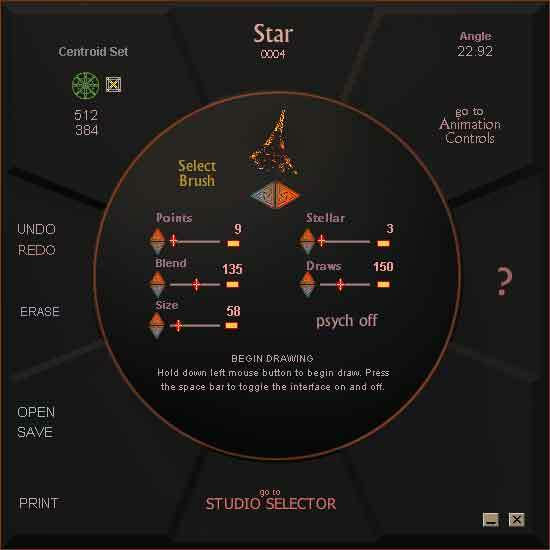 Unlike the other common Kaleidica Studios, the Star Studio has the unique distinction of allowing you to adjust both the number of points (i.e. the number of descrete tips or sharp endings) that define the start, but alow the "stellar" value. Simply stated, the "stellar" value is the number of points to move clockwise from the starting point when drawing each line of a start. For example: A five point start that we all can draw with a pencil on paper has a stellar value of two (2). 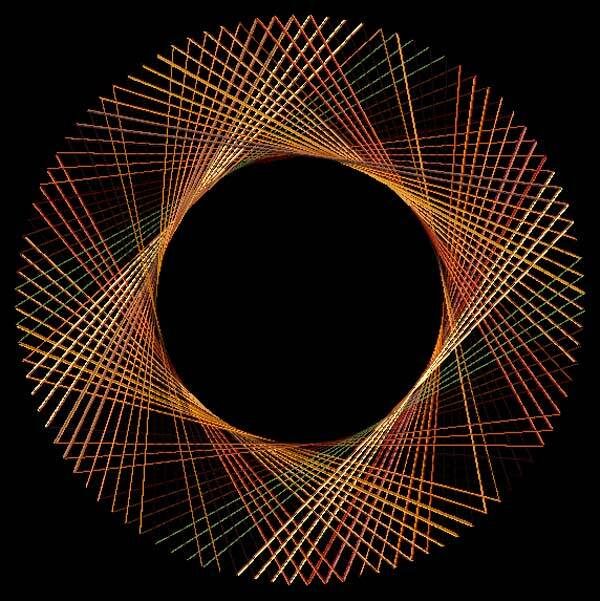 That is, each line of the star starts at a point and then draws NOT to the next point (moving clockwise) but to the "second" point it encounters. If the stellar value of a five point star is set to the value of one (1) then the Star Studio would simply draw a pentagon (five sided polygon). 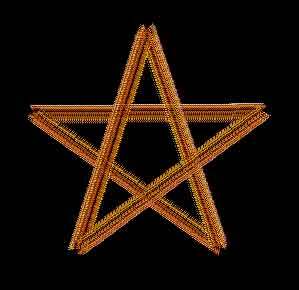 Each of the above are nine point stars (made with Kaleidica's Star Studio) but they look completely different because the stellar value is different. When stars are drawn with many points (like say... 3000) different stellar values result in completely different Moire patterns. The lesson here is to be very aware of the stellar value when drawing any star. As a side note, there is numerological significance to both the number of points (obviously) but also the stellar value of any star. Notice also that multiple polygons are formed differently for each stellar value. In the example above there are nine triangles in the left image (stallar=2), nine triangles and nine four-sided polygons in the middle image (stellar=3), and a total of 28 polygons in the right image. Now the "draws" value in Kaleidica's Start Studio is equal to the number of total impressions of the image that will be laid down each time the entire star is drawn on the screen. For example, a five point star with a draw value of 25 will have 5 images laid down on the screen for each of the five lines that make up the star. Large numbers of points need large numbers of draws. In some instances I have drawn stars with thousands of points and millions of draws. 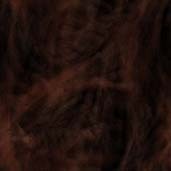 In these instances the brush size needs to be very small (2-4 pixels). That said.... you can use any combination of size, blend, number of points, stellar value, and draws to make a star. Here's a 300 point star with the stellar set to 201 and draws set to 400,000. The brush size was set to 4 pixels and the blend value was all the way up to 255. The image brush was an image of the Eifel Tower in Paris, France. Here's a nine point star made with an image of the Eifel Tower (at night). It was made with a stellar value of 3 and draws set to 18. All images copyright © 2007 by C.E. Henderson, All Rights Reserved, Any and all reproduction by permission only.